"As we move into 2015, I believe we will see more and more small manufacturing companies start to adopt software solutions that help better plan and manage day-to-day manufacturing operations. Forty-five percent of respondents in our survey were still using pen and paper or other manual methods to manage their workflow. I see that number dropping next year." – This is the conclusion of the 2014 Manufacturing Software Buyer Report published by Victoria Adesoba, researcher at small business manufacturing software analysis group Software Advice. I was kind of shocked by this figure: 45% of all SMB manufacturing planning processes still work on pen and paper-basis? That’s an amazing statement and it intrigued me reading the entire report and spending some thoughts on what this actually says about how software vendors support SMB manufacturing companies achieving operational excellence through better production scheduling. All in all, I found a total of four whopping figures. To me, these figures are undisputed facts why SMB manufacturers need visual production scheduling. Fact 1: 45% of SMB manufacturers manage processes using paper and other manual methods. Initially, I was unsure if this is a statement about the way that manufacturers work or if this is a statement about the appropriateness of ‘manufacturing software packages’ to support the SMBs’ planning and scheduling needs. Stepping back a bit and trying to look at this from a broader perspective helped me answering this question. If there is one industry which to my understanding is very technology-savvy, then it is the manufacturing industry. As a matter of fact, the so called ‘industrial revolution’ – i.e. replacing inefficient manual work by well-organized technology-driven processes – originated in the production-savvy environment. The use of technology had been a proven efficiency driver, and hence a source of operational excellence for this entire industry. So: Why would almost half of all SMB companies in such an industry prefer managing their workflows manually? With pen and paper? The only reasonable explanation for this research finding is that there is obviously a lack of appropriate technology to support the day-to-day planning needs of SMB production companies. As inefficient the “pen and paper” variant is, as natural it is for the person relying on it: people understand what they put on a paper, they keep the amount of information on a paper manageable, and they control what they write. Hence, the manually produced information is intuitive, transparent and manageable. 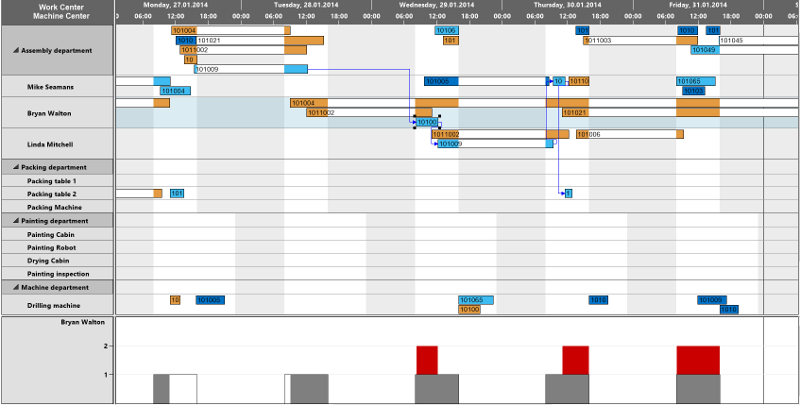 Consequently, rather than building highly sophisticated planning support systems that base on algorithms and assumptions which people rarely can understand, a natural first step to overcoming the ‘pen and paper dilemma’ would be to work with scheduling software which visualizes production data in an intuitive manner, and supports the users in making comprehensible drag & drop changes. Fact 2: 36% of SMB manufacturers have MRP as top requested software. OK – on the first glance, this is no surprise: when almost half of all SMB manufacturers still work in a paper-based manner, investing into software is an obvious means to achieve productivity gains. On a second glance, the big surprise is that the no1 software need seems to be the rather high-level and thus simpler MRP (material requirements planning) instead of a sophisticated APS (advanced planning and scheduling). So what does this tell? When more than a third of all SMB manufacturers see MRP as the top 1 requested software, this allows the conclusion that their primary concern is the capability to deliver in time. Building and having a schedule which is geared towards delivery time commitments undoubtedly is of great value. But what if unexpected incidents happen? What if a machine breaks down and the production order has to get routed to a different machine? How will this impact the delivery times of the orders already planned for this machine? What if a “top priority” production order gets pushed into the existing schedule? How does this influence the timeliness of all the other orders? Fact 3: 31% of SMB manufacturers look for tools to better help plan & manage day-to-day manufacturing operations. This finding is no surprise given the observations made with fact 1 and 2. If the majority of SMB production companies still plan their operations manually and see MRP as top 1 requested software, they are obviously looking for tools to improve the day-to-day management of their production processes. Given from where they are today (and also what they might be able and willing to spend) I recommend starting with a down-to-earth and merely manual approach rather than starting with a 6-digit investment into optimization software. Fact 4: 47% of SMB manufacturers want to implement the software solution within 3 months. APS systems always are based on algorithmic production process intelligence. This is in turn typically is the driver for rather lengthy customization projects. First, the algorithmic system has to get adapted to individual production environment. If customers are not willing to make this effort, the system will deliver results (e.g. in the form of a production schedule) that are not (fully) related to the respective needs. Second, for algorithms the rule “garbage in, garbage out” applies. That means that customers not only have to invest into adapting the algorithms but they also have to invest into an appropriate level of data quality to make these systems work. All in all, often the described processes make the implementation of an algorithmic system within 3 months hard to impossible. 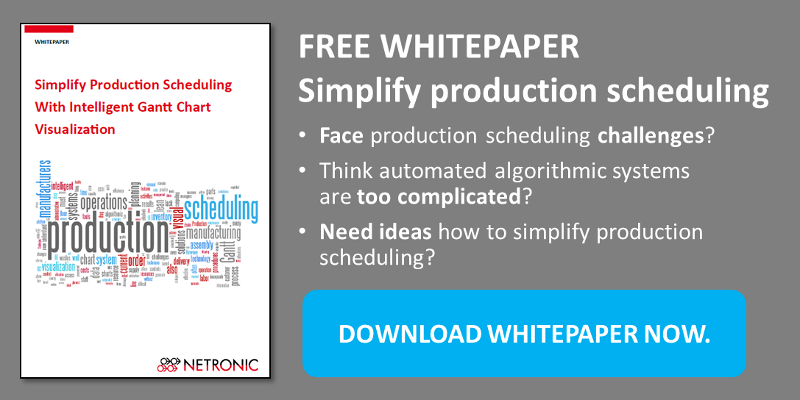 An alternative is visual scheduling which neither depends on algorithms nor on data quality: It works with data “as is” and allows the user to easily understand the underlying production schedule, and to react to short-term deviations in an agile manner. 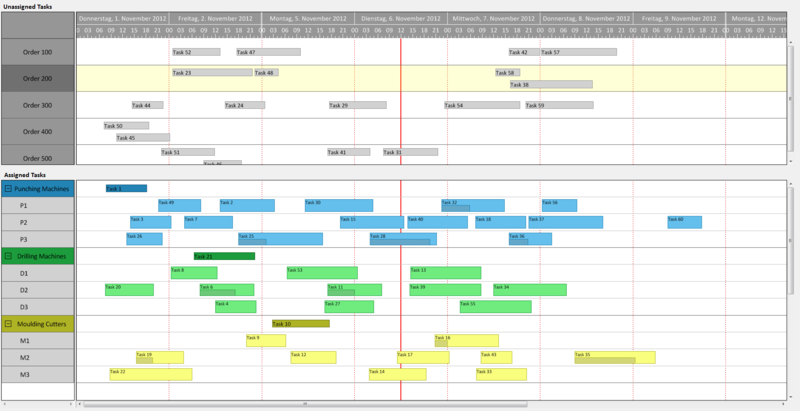 Want to learn more about how a Gantt chart-based visual schedule can simplify production scheduling? Read our whitepaper.